Just picked up a splurge-worthy cheese for your cocktail party, but not sure what drinks to serve with it? 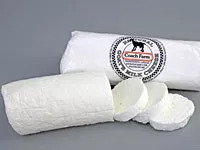 We're always wondering, too, so for this edition of Thirsty Thursday, we asked Tara Kirch, marketing manager of Coach Farm, to give us three different pairing suggestions for their fresh goat cheese. Just make sure to eat your fromage in moderation. One ounce of it has 5 grams of fat and 65 calories. So savor sparingly! The flavor: The cheese has a firm, dense texture with notes of lemon and grass. “I am really into the California Sauvignon Blancs right now, like Ehlers Estate 2009, with fresh goat cheese,” says Kirch. The two work particularly well together because of their similar flavor profiles; they’re both a little citrusy and a little grassy. “Beer and cheese pairings are getting huge right now,” says Kirch. She likes Brooklyn Brewery’s Sorachi Ace because it also has notes of citrus and grass. Plus, the bubbles from the beer's hops cleanse and refresh the palate. Both of these sparkling wines (Kirch likes Schramsberg 2008 Blanc de Blancs and Domaine Carneros 2007 Brut Rosé) have a bit of acidity to cut the creaminess of the cheese, yet have delicate citrus and floral flavors that don’t overpower it.